Holly Shaw: And There Was Skating. Lots and Lots of Skating. 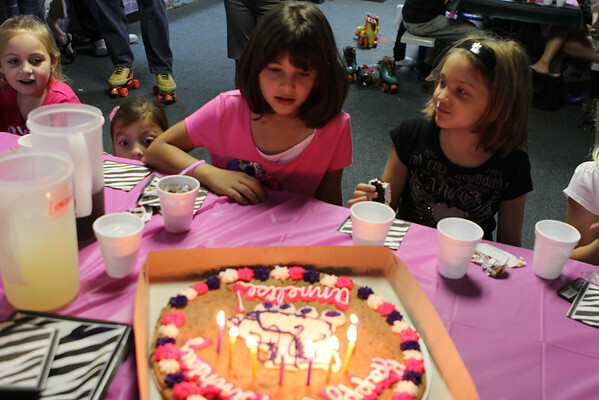 Saturday, after oodles of anticipation and excitement, Annelise's rollerskating 8th birthday extravaganza had finally arrived. But first we had to stuff favor bags late Friday night because our motto is why do things early when you can wait until the last minute. I told myself I wasn't going to stress about the favor bags, we weren't going to waste money on total junk that breaks before they even get home and we were going to keep it simple. Because the rollerskating invitations* had been postcards from the skate center (simple and easy but not so cute and creative which hurt my heart, but appealed to my lazy side just the same) and we couldn't decorate much at the skate place I was feeling a strong urge to put at least a few creative touches into some aspect of the party. 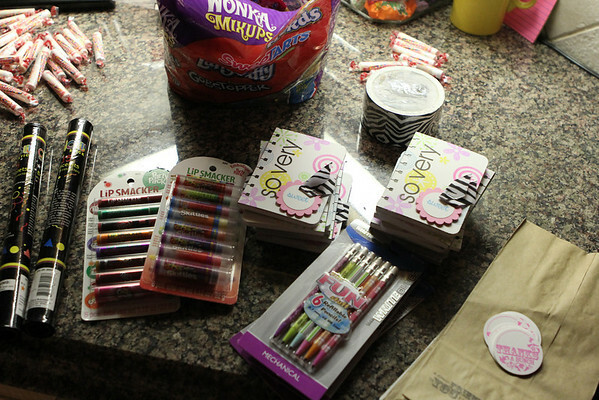 Since this was a girls only affair, we decided on glow bracelets, Lip Smackers, a cute mechanical pencil and a little notebook that I made embellished covers for and of course, CANDY for the favor bags. I hemmed and hawed about temporary tattoos (I know the girls like them but I couldn't find any that weren't borderline trashy or too mature) and couldn't find cute stickers that weren't too young or too, I don't know, trashy. I don't think peace signs, rockstar symbols or skulls are appropriate for 7 and 8 year old girls, even if they are pink and glittered, but maybe that's just me). Simple, but still cute (I think). And yes, that is zebra duct tape. Love. 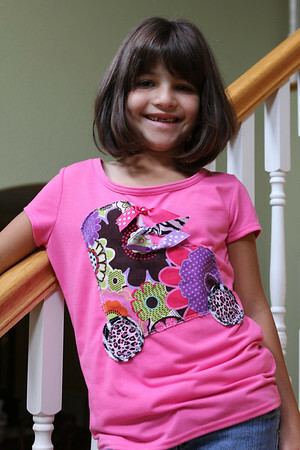 I also made a special shirt for our special birthday girl. Well, okay, I didn't make the shirt itself, but I embellished it. At 11:00 Saturday night, because that's how I roll. Please tell me it looks like a rollerskate. Please. Maybe a closer look would help. See, I told you it was a skate and not an oddly puffy heart with wheels. 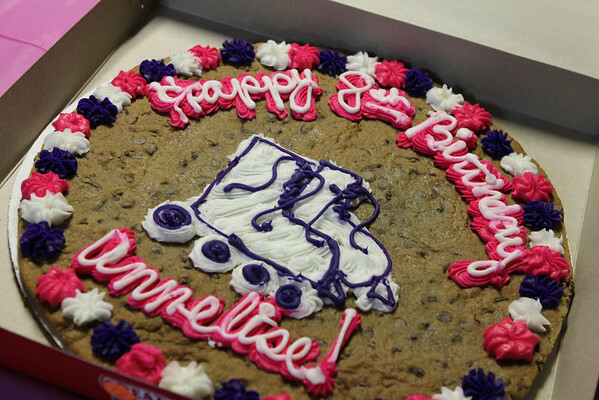 Instead of cake this year we opted for a giant cookie decorated with, you guessed it, skates. Annelise and six of her bestest buds (one little girl is missing from the photo because she was changing her skates) spent 2 hours skating their little hearts out, pausing only for pizza and soda which they inhaled in approximately 2.5 minutes so they could get back to skating. 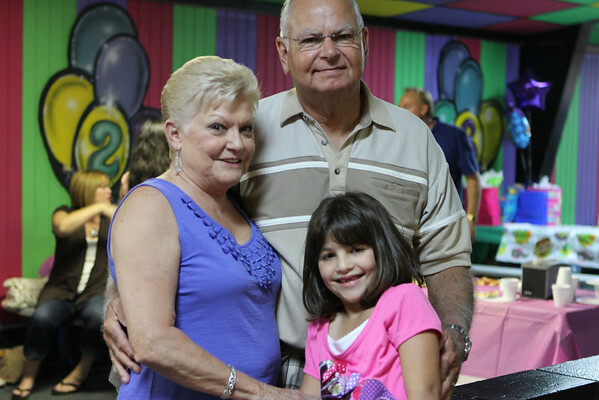 Annelise was thrilled her Pappo and Grandma were there, even though they didn't skate. The girls had a blast skating (of course), playing a few arcade games, skating, eating pizza, doing the Hokey Pokey, skating some more, being super giggly and silly (of course), skating in a race (Annelise won! ), gobbling up ice cream sandwiches and cookie cake, skating again, opening presents and skating again one last time. I had grand plans of taking pictures of Annelise with each of her friends, but that just didn't happen in all the crazy. Most of the photos I took of them skating turned out blurry or awkward (did I mention they were on eight wheels and always moving and it was dark?) and I missed taking any when Annelise opened her gifts (I was behind her trying to manage the flurry of tissue paper and write down who gave what gift). 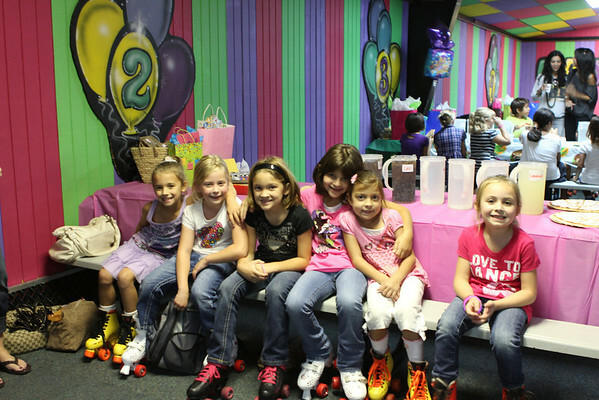 And if squeals of glee, ear to ear smiles and non-stop rollerskating are reliable indicators, I'm 99 and 44 100ths % sure Annelise and her little girlfriends had a fairly fun afternoon. *Excuse me for a minute while I get a teensie-tiny bit snarky. 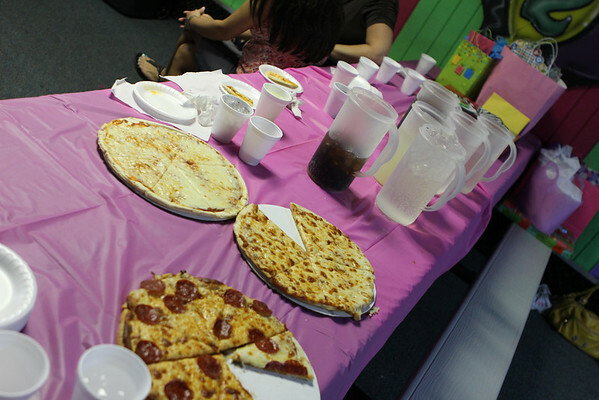 We invited 13 girls (all the girls in second grade plus two close girlfriends from church). 4 RSVPd yes and came, 2 RSVPd yes but weren't able to be there after all--but called to explain--and I'm totally okay with that, 1 mom said, "I guess we'll see you tomorrow," when I saw her at school on Friday, so I guess that was their RSVP, 1 arrived without an RSVP and the rest left me hanging. I wrote our phone # and our email address on the invitation, so there were options for phone-y people and message-y people and still there were crickets chirping. 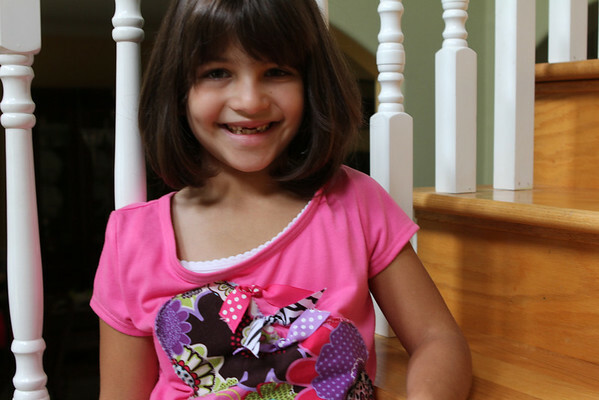 RSVP means a response, whether yes or no, is requested. I totally understand not every one invited will be able to attend, or will even want to (wait, what?) but it's still polite to respond one way or the other. Oh, and I should tell you that I am not perfect (really?) and have messed up on this issue too sometimes, but I do my best to RSVP. Okay, I feel better. Thanks for listening. What do you put in favor bags? Are RSVPs a thing of the past? How do you handle them? Looks like so much fun. The bags are so cute, good job! I do my very best to RSVP for every party. 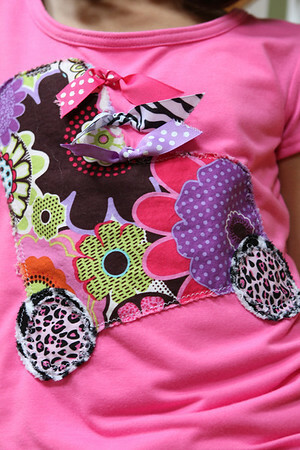 Adorable favor bags, cake, and shirt. It hurts my heart to do cookie cake from the grocery store but Griffin actually requested it last year and I ended up being thrilled. (I like a more traditional bakery cake with pretty fondant icing etc. 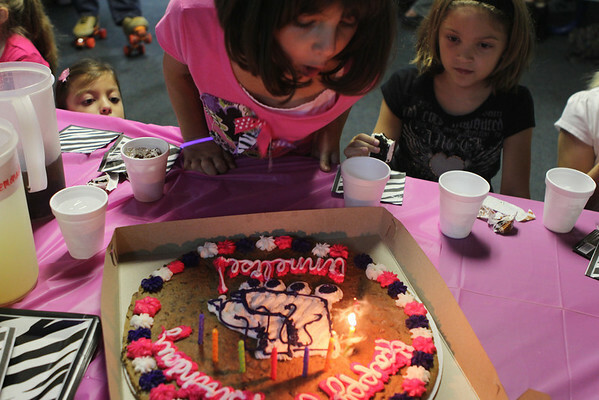 )Your cookie cake is way cuter than ours was. We have RSVP issues every single time. We always seem to have great turn out but really, it would be nice to know that 20 kids will be showing up when only like 2 have confirmed! What a fun party! I haven't been to a skating rink in ages but I remember being about like A - barely stopping long enough to scarf down something to drink. I am sure they had a blast! On the RSVP front. I try to respond either way, yes or no. I would *hope* that someone would at least let you know that they were planning to attend just you could make sure you have enough food, favors, etc. 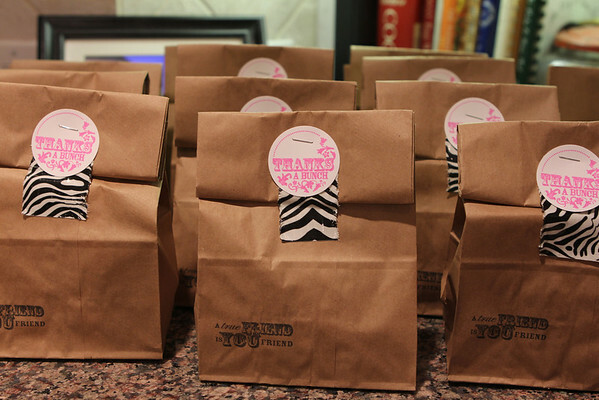 Treat bags=cuteness! I am with you on the RSVP thing. The no response either way issue is so rampant that I am beginning to think people don't know the RSVP rules. Major pet peeve with me. We live in social networking overkill yet when it comes time to be social when it matters it's a big fail. I'm struggling with the RSVP issue right now, and it's making me CRAZY! I've planned my son's birthday party...invited 15 for Friday, and only 2 RSVP'd so far. Now I'm worried...did the kids actually GIVE the invites to the parents...do I call to follow up...send an e-mail...do nothing and plan for all? It kept me up last night worrying about it. (Kind of silly, huh?) I'm sure all will be well, but I still think it's really inconsiderate.